Texas Russian Blue Rescue View other Russian Blues for adoption. Hi there! My name is Bowie, and I was named for David Bowie because I am such a handsome rock star with my high cheekbones and cobra-shaped face, which sports a perpetual smile. 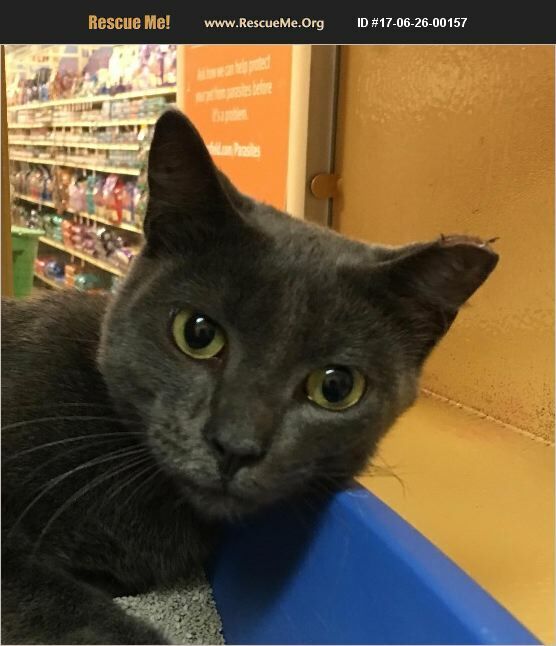 I was born in June 2014 and am a quiet, easy-going Russian Blue/ silver DSH mix with the Russian Blue's signature sleek steely-gray coat, lithe body, and beautiful green eyes. We Russian Blue mixes are known to be lovable, loyal, gentle, quiet, well-behaved, super intelligent, and clean. Now how can you beat that? My long legs and tail as well as my lean body give me an exquisite, stately, elegant aura. I also have a unique feature in that my tail is shorter than most; I guess that I was just born that way! To find out more about Russian Blue mixes, please watch the 3-minute You Tube video that appeared on Animal Planet by googling 'Cats 101 Russian Blue.' I adore having my belly rubbed; in fact, I really love an all-over kitty massage when my foster mom has the time. I tend to keep to myself but am not aggressive towards other cats. My favorite spot is high on the cat tree where I can observe the antics of my other furry feline foster mates. The dog, however friendly, is not my cup of tea. Life has not always been as idyllic as it is now in my foster home. I was living a hardscrabble life on the streets when my foster mom first spotted me. She thought I was feral, so she trapped me with the intention of neutering me and returning me to the street. However, I surprised her by being a sweet, laid-back boy. Perhaps I was a companion cat who just got out and never made it home. Since maybe that was a long time ago or since maybe I'd never been in a home before, I hissed at first, but I soon adapted to the comforts of indoor life. No more dumpster-diving and caterwauling with other stray cats for me. No sirree! As much as I love relaxing in my foster home, I hope to find a quiet oasis in my lifetime indoor home, where I will be cherished and adored like I deserve. Won't you come give my a belly-rub today so that I can show you how you can't live without me? Bowie is updated on shots, neutered, dewormed, microchipped, FIV/ FeLV negative, and ready for his indoor-only home. No de-clawing permitted. His adoption fee is $100, cash or check payable to Buster's Friends. Please click the contact button if you are interested in Bowie, and we can let you know exactly where you can meet him. To make the process more efficient, download the adoption application at http://www.bustersfriends.org/catadoptionapplication.shtml. First save and then open it; then you can print it and fill it out.